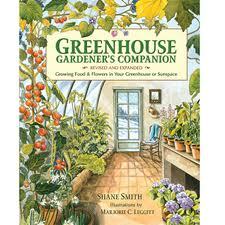 Excerpt from the book Greenhouse Gardener’s Companion. . . . The feijoa, also known as pineapple guava, is a small tree or shrub that produces beautiful red and white flowers and a tasty round fruit. Even though it is called a guava it is not a true guava but who really cares? Especially since it is easier to grow than a guava. The plant grows to 15 feet (4.6 m) or more and has thick grayish leaves, which it keeps year-round. It is a perfect plant for most any greenhouse because it tolerates both cool winters and hot summers. Some varieties are not self-fruitful, meaning you need to grow more than one variety. You should avoid these varieties. Fortunately, there are varieties that readily set fruit solo, saving you precious space. Some self-fruitful varieties of feijoa include apollo, collidge and nazemetz. When the feijoa flowers in spring, take a small paintbrush and dab the yellow pollen onto the female element in the center. The fruits begin to mature mid-summer into late summer and are about 2 to 3 inches (5 to 8 cm) across. They are easy to tell when to pick because they fall to the ground when they are at their perfect state of ripeness (don’t let them sit on the ground too long). The skin of the fruit is tough and not edible. Cut the fruit in half and scoop out the inner sweet meat. The small seeds inside are quite edible too. The taste is akin to pineapple but hard to relate to anything else. I think it tastes delicious. For adventuresome eaters, you may want to try eating the flower petals of the feijoa. They are entirely edible with succulent marshmallow like leaves and are slightly sweet with no bitter aftertaste. My kids call it the marshmallow plant. The petals are thick and fleshy. They are two-toned with white on one side and red on the other. Try slipping some into a salad. Luckily you can harvest the flowers without hurting later fruit production. The plant tends to flower in the spring and set fruit throughout the summer months. I always wait until the plant drops the fruit to the ground. It is at that point that they are at their perfect ripeness. Cut the fruit in half and scoop out the delicious, sweet meat. There are only a few bites per fruit but they are among the best and easiest fruits you can grow in a greenhouse. Feijoa does fine in a tub of at least 10 gallons (38 l), as well as in ground beds. It may take a few years before the plant is mature enough to produce fruit, but after that it can be productive for many years. The plant is drought tolerant and actually needs to dry out between waterings. It takes well to pruning if you need to control the growth or height. You will probably have to purchase your first plant from a catalog that specializes in tropical plants. Once you have a plant, it is easy to propagate new ones from stem cuttings of new growth. While you may see an occasional pest on the plant it is rare that they have any effect on the plants health or its production. Every greenhouse should have at least one. This entry was posted in Fruits & Vegetables, The Blog by shane. Bookmark the permalink.